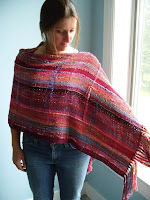 This week's EtsyInspired shop is Barefoot Weaver. This shop is FULL of woven yumminess. I absolutely love weaving because it's so intricate and beautiful. I think most people take for granted how much time it takes to make something like these awesome creations. One of the things I really love about this shop is the colors that are used on the items. They are bright and beautiful without being too over the top. Another super cool thing about this shop is that they offer woven jewelry which is something I've never seen before. Other items available in the shop include scarves, wraps, shawls, neck warmers and different sized cuffs. This week, Barefoot Weaver is offering up this GORGEOUS flower as a prize. Seriously, I want to win this! ACK! It's so pretty! To play along, all you have to do is go to the Barefoot Weaver shop and pick any item to be inspired by. Make any creation that you'd like (card, cake, jewelry, song, dance, photograph, etc...) and post a link to your creation on the EtsyInspired #64 post on the EtsyInspired blog. Please link your creations by next Friday Dec 4, noon Pacific time to be entered in a random drawing to win. If you upload to SCS or PCP, please use keyword EIC64. Along with our amazing prize from our shop, we have an awesome sponsor this week! It's 7 Kids College Fund! I love this store! They have everything! 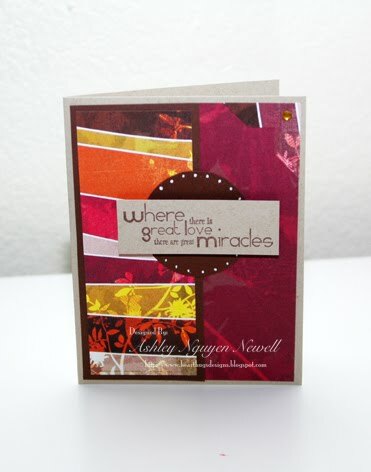 They are offering up a High Hopes Stamp (seen HERE) and a Green Apple Memory Box Notecards (seen HERE) for a prize! Here is my card for this week. I combined this challenge with the current challenge over at 2 Sketches 4 you. The paper is Basic Grey, Indian Summer. The stamp is Unity. So pretty Ashley! I really love this! This is beautiful Ashley! I love the colors....awesome work!!! The gorgeous colors you chose are perfect for this shop filled with beautifully colored pieces! Hope you're having a wonderful weekend! The colors you chose for your card are stunning! Very pretty card! Great job with the sketch! So pretty and unique...love the elements you included here!